Lose pounds and feel amazing from exercise! The thyroid gland plays a key role in removing fat from body stores and using it for energy. 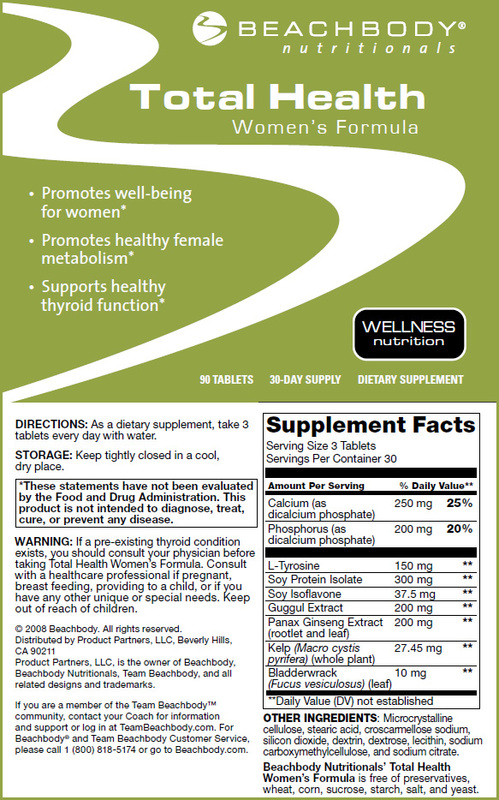 Total Health Women's Formula contains a special blend of three vital ingredients to ensure the thyroid can play its proper role in response to any vigorous exercise program—without risky ingredients like ephedra. The soy isoflavones in this formula may help reduce some menopause and PMS-related symptoms. This is just one of soy's many incredible benefits, which explains why it is fast becoming one of the most highly recommended nutritional products for women. Specially formulated to support women's nutritional needs, Total Health Women's Formula can help you tone muscle and achieve greater weight loss with your fitness program. Try it for 30 days and if you're not satisfied within those 30 days, just return it for a full refund of the purchase price, less shipping and handling!